While typically known for its beautiful beaches and tropical scenery, Indonesia holds a dark secret. Across the country, every year millions of dogs and cats are stolen from their families and homes, crammed into wire cages and sacks to be transported to slaughterhouses and markets throughout the country. Their suffering is immense. The journey typically lasts for days and many die along the way due to injury, lack of food and water, or stress. 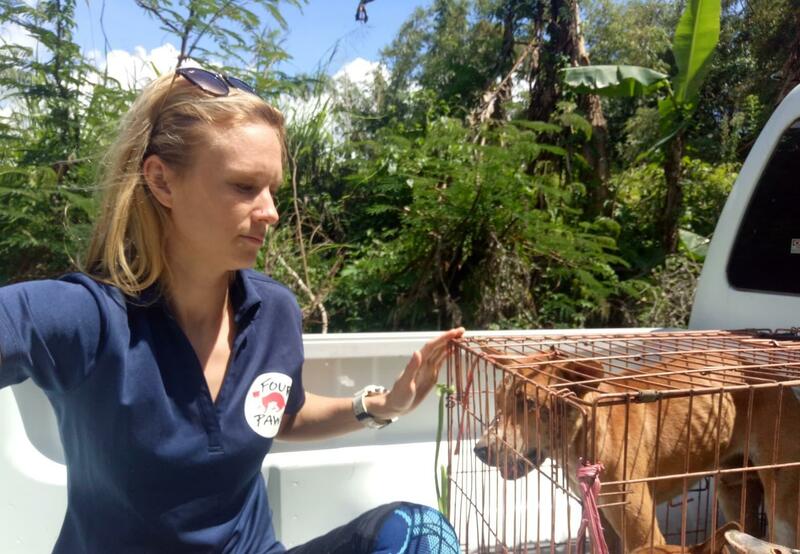 Besides the obvious animal welfare issues, disease testing has shown that many of these dogs are rabies-infected, putting both tourists and the public at risk from the deadly disease. While less than 7% of Indonesians consume dog meat, the trade jeopardizes the public health of all citizens. This is why FOUR PAWS has teamed up with other local and international charities as part of the Dog Meat Free Indonesia Coalition to stop this terrible trade. In addition to the cruelty that comes with the dog meat trade, the province of North Sulawesi is home to several live animal markets – locally known as “traditional markets” which are places of unprecedented suffering. 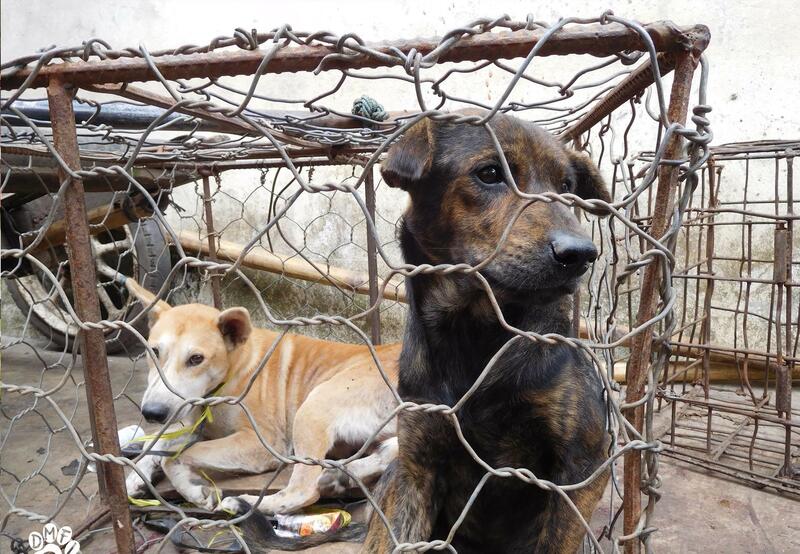 Every week, tens of thousands of animals are traded and slaughtered there, including thousands of dogs and cats. All of them are being blowtorched alive to remove their fur. FOUR PAWS was on the ground at one of these traditional markets, the Tomohon Extreme Market to conduct undercover investigations and meet with the City of Tomohon officials. We timed our visit to coincide with the Indonesian Thanksgiving, a time when tens of thousands of dogs and cats are killed for holiday celebrations in North Sulawesi. During our investigation, the suffering that we witnessed was too great to simply ignore. Dogs and cats huddled together tightly packed in cages, trembling in fear as they watched each other being slaughtered. One by one a dog would be grabbed out of the cage with metal tongs and smacked once or twice over the head with a metal bar as he screamed out in pain. Many began having seizures from the blow to the head. They were then tossed in the street where they would then meet their final fate. The sounds and smell of the burning hair and skin as they were being blowtorched was truly sickening and will haunt me forever. At that moment, we knew we had to do something despite how overwhelming the situation was. Two cats immediately caught our eye. One was cowering in the back of the cage, trying to make herself invisible to the butcher. When I got close enough to her I noticed that she had gotten too close to the flame that was being used on the other cats, and all of her whiskers were scorched and burned. Another cat, a ginger boy, walked around the cage incredibly fearless and friendly, meowing for attention. We knew we had to act fast and were able to negotiate with the butcher to allow us to rescue these two very special cats, later named Daisy and Tulip. Despite not knowing each other in the meat cage, they quickly became best friends once rescued, probably bonding over their traumatic experience. Both were taken to a local shelter where they received immediate medical care and comfort. Along with them we managed to rescue five dogs. After months of campaigning, this month we celebrated a major breakthrough – the Indonesian government agreed to issue a nationwide ban on the trade of dog and cat meat in Indonesia and to prohibit the issuance of health certification for dog and cat meat for human consumption. This announcement came just days after FOUR PAWS helped issue an international public warning that millions of tourists could be at risk of exposure to the deadly rabies virus spread by the county’s illegal dog and cat meat trade, just two weeks before Indonesia hosts the 18th annual Asian Games which expects thousands of oversees visitors. The announcement came at a “National Coordination of Animal Welfare” meeting in Jakarta held on August 1st and 2nd by the Directorate of Veterinary Public and was attended by national and regional government representatives. The results of this national meeting will be used as a recommendation for the Ministry of Agriculture to formulate a PERMENTAN (Minister of Agriculture regulations) regarding the ban on trade in dog and cat meat and that of exotic animals in Indonesia. Given the growing evidence of the risk the trade poses to rabies transmission, coupled with the evidence of animal cruelty and illegality, FOUR PAWS wholeheartedly welcomes and applauds this groundbreaking development. We look forward to partnering with the Indonesian government to help make this ban a reality. 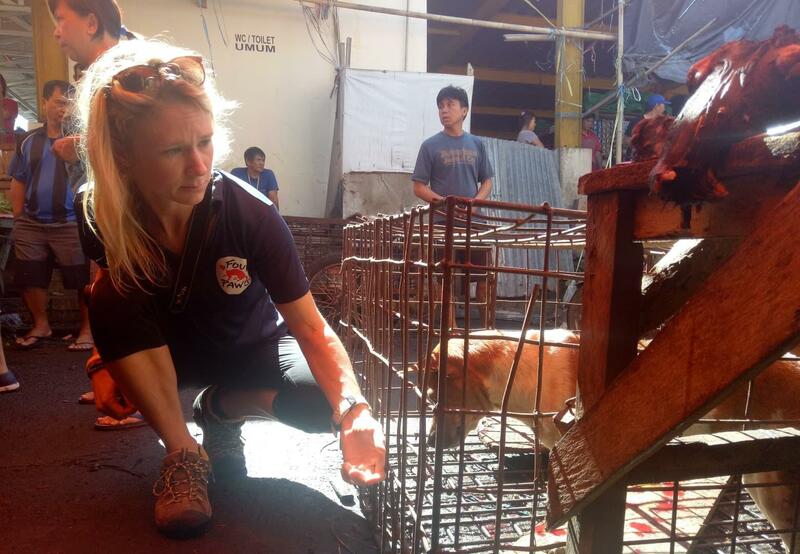 In the meantime, we will continue our attempts to rescue additional dogs and cats from the markets, shut down illegal slaughterhouses, and protect all companion animals in Indonesia from such cruelty.